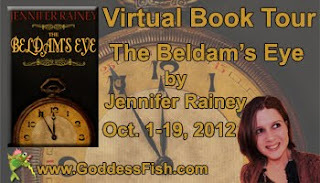 This post part of a virtual book tour organized by Goddess Fish Promotions. 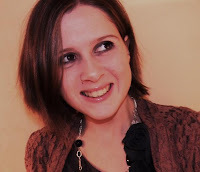 Jennifer will provide two $20 Amazon GCs and five copies of Thoroughly Modern Monsters, her short story collection to randomly drawn commenters during the tour. The grand prize to one randomly drawn commenter will be a $25 Amazon Gift card, a copy of These Hellish Happenings (her first novel) and a copy of Thoroughly Modern Monsters. Click on the tour banner above to see the other stops on her tour. I live life with my hand constantly hovering over the panic button. I’m not always the calmest person in the world. I occasionally, well… freak out. This is not very conducive to productive writing days (or productive days in general, for that matter). Whether it’s over a deadline or a spider I saw lurking in the corner of my bedroom, these freak-outs are not very appreciated. However, just because I’m prone to panicking does not mean my characters are. The Beldam’s Eye focuses on two paranormal investigators, Mr. Bramble and Mr. Yeats. If you were to look up the phrase “cool as a cucumber” in the dictionary, you would most assuredly see Yeats’s face. He battles evil spirits without breaking a sweat! Writing a character as calm and collected as Yeats has taught me a few tips about keeping my cool, tips which I will share with you. 1. Keep everything in perspective. They always say not to sweat the small stuff… and it’s all small stuff. This is mostly true. What seems like it may be the end of the world, probably isn’t. 2. Take it one step at a time. Yeats can get into some fairly sticky situations as a paranormal professional, but he remembers to take everything step by step, case by case. Looking too far ahead into the future can be overwhelming. 3. Music soothes the savage beast. If I’m feeling a little stressed, I put on my favorite tunes. Yeats prefers the grunge he listened to while growing up, while I prefer folk music, but you can listen to whatever floats your calm little boat. 4. Indulge every once in a while. It keeps you chilled out. Yeats smokes. I have asthma, so I don’t smoke, but the occasional piece of chocolate seems to work just fine for me. 5. When all else fails, just think of a calm, blue ocean in your mind. Yeats only resorts to this in dire situations (such as when his business partner is being held ransom). And there you have it! I can’t thank Mr. Antony Yeats enough for his help. Through writing him, I have learned to keep my hand a good foot or so from the panic button, rather than hovering right above it. Great post. I love the list. Good luck with your book and thanks for the contest. I hope I win. Can't get enough of that chocolate! It's even better with peanut butter. :P Thanks for commenting! I love the list, but number 5 would not relax me. I am terrified of large bodies of water. :( Thanks for the list! Oh no!! Well, nix number five, then! I loved reading about your history. I really enjoyed the interview. I can see I am going to love Mr Antony Yeats. As a non-fiction writer these days, I certainly appreciate your pointers! Thanks so much! great post!